Greater Augusta Prevention Partners Coalition staff work with area high schools to develop and/or maintain active Student Against Destructive Decisions (SADD) clubs. Staff conducts presentations during club times and offer other outreach activities to SADD clubs. Coalition staff hold regional SADD club meetings with advisors and their leadership teams to help strengthen clubs, assist in program planning, coordinate guest speakers, and serve as a community resource. The Youth Alcohol and Drug Abuse Prevention Project (YADAPP) is a youth leadership conference for high school students from all over Virginia held at Longwood University during July. Sponsored by the Virginia Department of Alcoholic Beverage Control its mission is to develop youth leadership in order to foster substance abuse and violence prevention efforts at the state, regional and local level. Students who attend YADAPP return to their schools with a “Strategies To Act Now” (STAN) Plan. This plan is meant to target underage substance and alcohol abuse in their schools and communities. Teams are made up of four students and one adult sponsor. Students are motivated to fight substance abuse from the first steps they take on the campus to the tearful goodbyes at the end of the week. Each year, Coalition staff, SADD advisors, and youth attended YADAPP. GAPP staff coordinate and direct youth to conduct Project Sticker Shock campaigns in the City of Staunton, City of Waynesboro, and Augusta County. Project Sticker Shock is a community awareness program designed to prevent people 21 and older from purchasing alcohol and providing it to underage individuals. Participants involved in Project Sticker Shock visit partnering stores and place stickers with a warning message about the penalties for providing alcohol to anyone under 21 and using a fake ID to purchase alcohol. 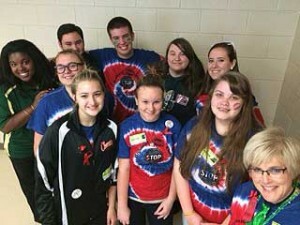 Any high school age youth is encouraged to be a member of their high school SADD club. Any high school age youth who would like to participate in Project Sticker Shock or attend YADAPP should contact Nancy Tyree at 540-332-3806 or email Nancy for more information.